and the fact I've knitted my nineteenth & twentieth socks of 2011. 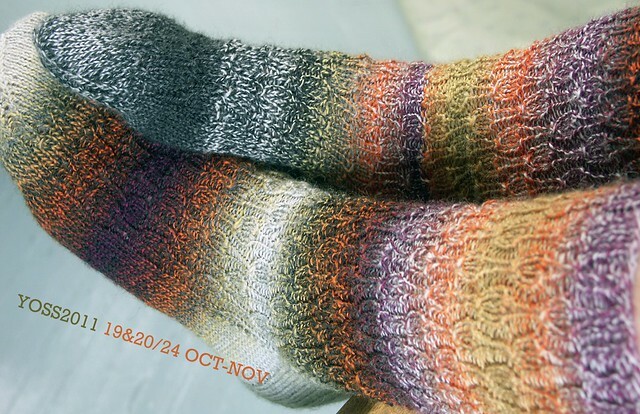 Win a pair of hand knit socks! Comment on this post with something you are thankful for to enter the giveaway. Life is full these days! However all of this abundance in experience has created a shortage of knitting time. It was a push to finish these socks made of the beautifully colored Schoppel-Wolle Crazy Zauberball yarn in two months. So I've decided to let this pair count for October & November. If you have followed my progress throughout the year and have commented on all the other YOSS posts, your thanksgiving comment on this post will count EIGHT times. If you haven't entered the giveaway on previous posts, this is your best bet. Posting your thanksgiving comment below will gain you FOUR chances to win a pair of hand knit socks! All YOSS posts are open for comments until the close of the giveaway on December 31, 2011. Leave a comment on every YOSS post in 2011 and you will have 48 chances to win! More info: YOSS2011 Giveaway. HAPPY THANKSGIVING! LIFE IS GOOD!